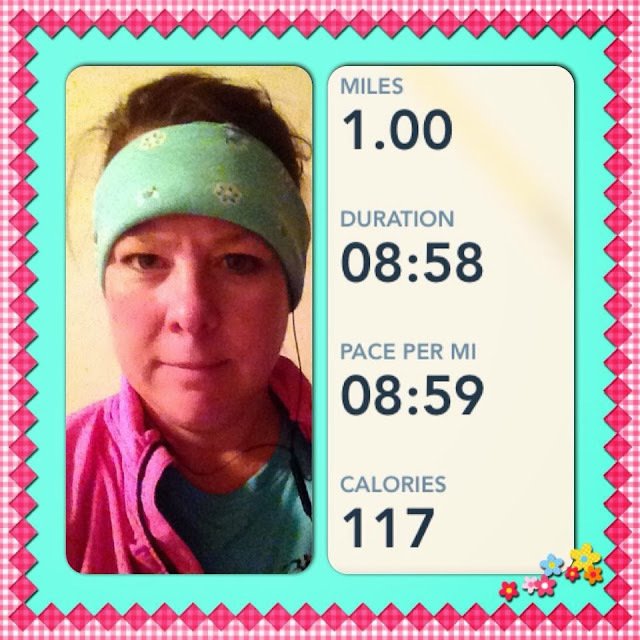 Day 12 of the run streak! I should be doing some longer runs but it's freaking cold! I'm a whimp, it's ok, I'll own it! It's supposed to warm back up to the 50's and 60's next week. THANK YOU GOD! I used to wear bandannas for headbands (not on my forehead of course) all the time when I was in high school and then they outlawed them for "gang paraphernalia". I just liked them to hold my hair back sheesh. Today there was so many little heaters plugged in at work they blew a fuse or something. I think that's a hint to the maintenance people that we are freaking freezing. For some odd reason we can't control the heat and air in our building. It's all done somewhere remotely by computer or something so everyone has fans and heaters (except me because I still need to go buy another heater). I borrowed one today and had that baby cranked up to high almost all day. I think I took my jacket off at like 10. God forbid it ever gets really cold here haha. In other news Scott went back to work today! He should be home any minute. I'm pretty sure he's freaking exhausted and going to eat and pass out. Poor guy! Still waiting on his disability check to show up. I'm getting a little anxious. I hope it doesn't take much longer. Not like you can call and find out what's going on with their automated hang up on you phone system. And of all the agencies to cut back on why do they pick that one? They close at 12. I can think of a lot of agencies that are less important than unemployment and the disability offices. Maybe they could cut back on their trips to other countries and such and you know, work via teleconference and video chat like we do. Trevor had a dentist appointment today and actually didn't have any cavities AGAIN! It's a freaking miracle. Either that or we've already filled up all the little nooks and crannies in his teeth. He wanted some ice cream to celebrate so I took him to Baskin Robbins where he got his huge double scoop waffle cone. I don't know WHY he's not hungry for dinner. I passed on the ice cream because it's freaking freezing. I asked the guy if they had hot coffee and he didn't even bother answering me haha. Ok off to wash dishes and read my book. I'm reading The Shoemaker's Wife. We read a few of the other books by this author for book club before and they are pretty good. I saw this one was only $1.99 so I bought it. (It still is if you click there on the link and no I'm not getting paid to say that). Glad to see you are still running...even when it is cold! :) I actually enjoy running in the colder months as I tend to get headaches from the heat. But it sure is cold lately...I want to hide in my warm house all day!